Identifying a patient's viral infection or diagnosing a blood disorder usually requires a lab and skilled technicians. But researchers at Princeton University have developed a new technology that goes a long way toward replacing the lab with a single microchip. "The key idea is to allow complex optical systems in modern-day chips," said Kaushik Sengupta, an assistant professor of electrical engineering and one of the project's leaders. "All smartphones carry a million-pixel camera. How do we turn this into a device that allows laboratory-quality diagnostics?" "We show these complex optical biosensor systems can also be realized in the same technology with absolutely no change in manufacturing the microchip," Sengupta said. The researchers found that tiny metal layers already built into modern microchips can relatively easily be adapted to take advantage of light's unusual behavior when interacting with structures smaller than a single wavelength of light. Harnessing the light in this way allows for detection of thousands of biological substances from bacterial DNA to hormones. 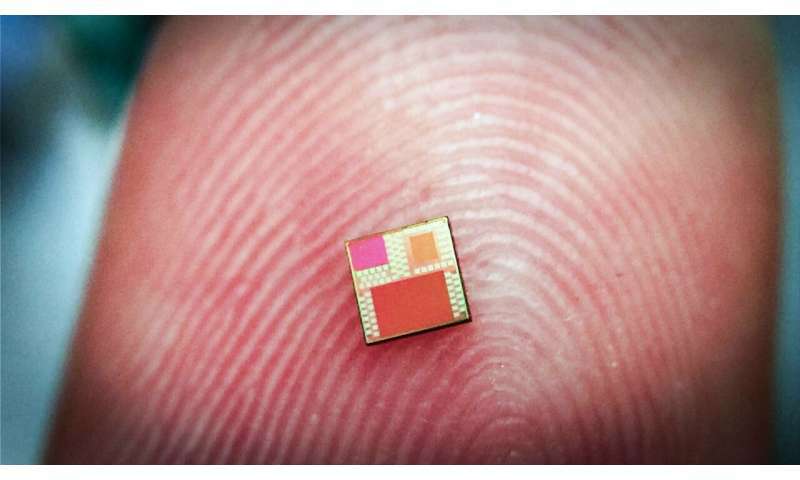 And because modern microchips already are designed to be extremely small, these structures can be made using standard manufacturing techniques, Sengupta said. Although more work is required, the researchers hope the technology will lead to diagnostic systems contained in a pill or deployed on a smartphone. "We show for the first time that this level of optical field manipulation is possible in a silicon chip. By eliminating all classical optics, the system is now small enough that you could start thinking about putting it in a pill," Sengupta said. "You could start thinking about diagnostics inside the body in a way you could not think about before." The new sensor chip, like a classic lab setup, detects targeted molecules by using chemical antibodies that are designed to react in the presence of a specific molecule. The antibodies are modified to generate light at a specific wavelength (fluoresce) when they are exposed to the target. In a standard lab, the antibodies are placed in small wells on a testing plate about the size of a playing card. 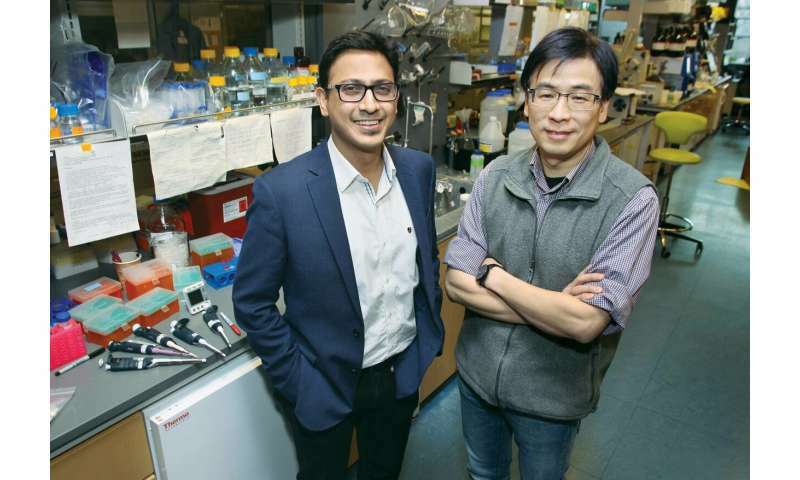 To make the assembly small enough to fit onto chip measuring 4 mm per side, Sengupta and his group worked with the group led by Haw Yang, a chemistry professor, to develop new techniques to prepare and distribute the antibodies. Working as team between two labs at Princeton, the researchers were able to design a plate with 96 antibody sensors that is small enough to fit on the chip. As in a standard lab, the small plate is exposed to a testing sample, typically a liquid. Antibodies that come into contact with their specific target molecule will glow a faint red when exposed to ultraviolet light. Unfortunately, the red glow is incredibly dim compared to the ultraviolet light used to trigger it. That presented one of the most significant obstacles for the researchers. "The ratio of light is the killer," Sengupta said. "We are shining between 10 million and 100 million photons at the target for every one photon that we get back." Much of the space taken up in a standard tabletop detector is made up of optics and lenses used to filter this tiny red glow in order to distinguish it from the wash of triggering light. The new technology allows the researchers to do away with this system by using tiny metal layers embedded in the microchip to process the light. Because the tiny structures are built in the silicon chip, the researchers said the system can be mass produced and does not require detailed assembly in a lab. Sengupta said the ability to quickly and cheaply manufacture the device will be critical to the eventual production of new sensing equipment.